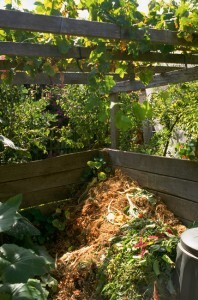 Just as the success of a meal depends on the quality of the ingredients, so too does the success of a compost heap. If you add only kitchen scraps you’re likely to end up with a slimy, black mess and if it’s all leaves and twigs then the chances are that is what will still be there months later. 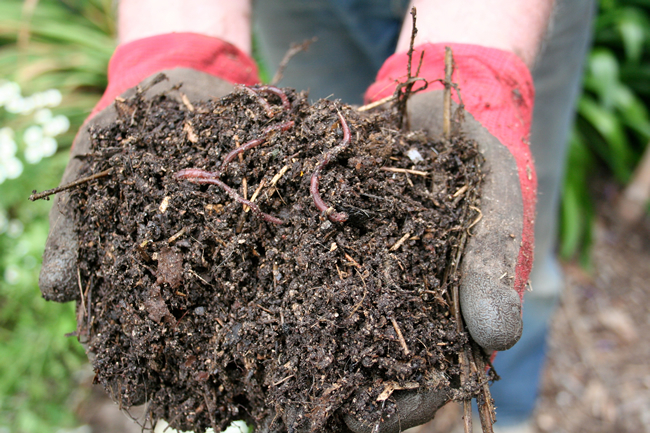 The fine detail of a compost recipe varies depending on the expert you are consulting, but all compost systems require free drainage, adequate moisture and a mixture of strawy, open material and green plant tissue. The purpose of composting is to break down garden and kitchen ‘waste’ into humus that can then be added to the garden to supply nutrients in a form that can be readily used by plants. Compost can just 'happen'. This one has kitchen scraps, straw and green waste. Basic compost ingredients are kitchen scraps, manure (chook, cow, horse), soil, shredded paper, straw and green waste from the garden. This green waste can be made up of grass cuttings, leaves, weeds and leafy prunings. Sticks and branches are also fine as long as they are cut or mulched into small pieces. These ingredients should added in layers in much the same way as you would make a moussaka, but instead of eggplant, meat and cheese sauce your layers would consist of kitchen scraps, manure, garden waste and straw or shredded paper. If you are like me and not organized enough to have all these ingredients ready at the same time, then you can just add them as they are available. In the words of the old Zen master, ‘compost happens’. It may take longer but it will get there in the end. Don’t add diseased plants, or weeds such as couch, oxalis and onion weed, but conversely there are some plants, including some weeds, that will actually add specific nutrients and even help the compost to break down more quickly. My compost recipe requires regular additions of annual and perennial chamomile (Matricaria recutita and Chamaemelum nobile), comfrey (Russian comfrey, S. x uplandicum Bocking 14 is the best cultivar to use), dandelion (Taraxacum species), nettles (Urtica dioica), tansy (Tanacetum vulgare), valerian (Valeriana officinalis) and yarrow (Achillea millefolium). Regular handfuls of chamomile, dandelion and yarrow leaves and flowers will all speed up decomposition of the compost with yarrow being the most effective. 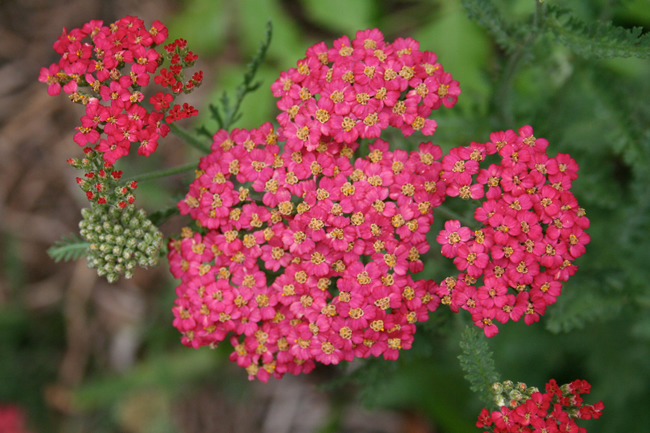 Yarrow also adds copper, nitrates, phosphates and potash while chamomile adds calcium and ‘sweetens’ the mixture. Dandelions contribute copper, iron and potash. Nettles are problem weeds but they actually improve the quality of the soil they are growing in and when added to the compost they contribute iron and nitrogen. Tansy adds potassium, which is very important for plant growth while valerian increases the phosphorous content so essential for good flowers and fruits. Probably the most useful compost plant is comfrey. The leaves are rich in potassium, nitrogen, calcium and phosphates. I keep a clump growing next to the compost and add a handful of leaves whenever I throw in kitchen scraps. 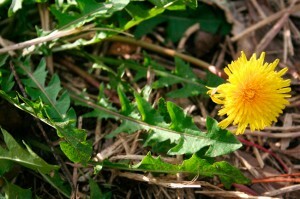 Dandelion leaves and flowers help to speed up decomposition. Yarrow adds copper, nitrates, phosphate and potash to the compost. 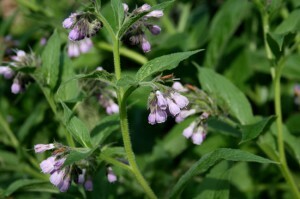 Comfrey is the most useful of all the compost herbs. We all know that adding herbs to food increases the flavour and enjoyment of the food. Adding herbs to compost doesn’t quite make it good enough to eat, but it speeds up and improves the composting process. It also ensures that the compost you add to your garden has a good balance of nutrients thus promoting the health and fertility of the soil, so essential for healthy plants. I have been trying to make compost for years, usually ending up with something I think is supposed to be compost but takes forever. Until this year when I started adding comfrey to the mix (the plant popped up in my garden by itself!) 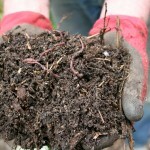 After only a couple of months I have the most beautiful compost, full of worms and ready to go. Well done on finally having compost that works! Comfrey is a great plant, especially because of it’s deep roots that bring nutrients up from deep in the soil. As well as adding them to the compost you can also just lie the leaves on the surface of the soil around a plant, mulch over the top, water well and wait for the leaves to break down, returning their nutrients to the soil. 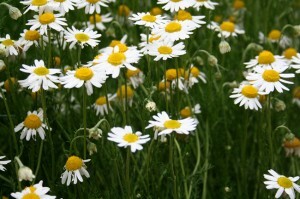 Some comfreys will self sow around the garden so keep an eye out for these interlopers as they can become problem weeds. You can stop this happening by planting a variety of Russian comfrey called ‘Bocking 14′ that doesn’t self sow, or you can constantly remove the flowering tops before they set seed. Also make sure you plant comfrey where you want it to stay, as it will re-shoot from any small piece of root and can be very difficult to eradicate. Hello Penny, Green organics is a better term than green waste. It is a resource to be recycled in the garden. I make my compost from leaves (deciduous and eucalypt, depending on the season), grass clippings (from the bowling club), coffee grounds in commercial quantities and a bit of mushroom compost to add heat. I make a batch in an open pen by mixing all ingredients and watering well. The mixing is important to aerate and bring all ingredients into contact with the grass where the heat is generated. After 2 months it is transfered in to the enclosed type bin for the worms to work their magic in a dark environment. Beautiful compost/humus is the result. I might try adding the herbs as you suggest. PS I heard you talking on 3CR gardening show this morning, well done on the web site. I will be a regular visitor.